Designed with the outdoor user in mind, this Garmin GPS unit weighs a light 7.5 ounces and measures a pocket-sized 2.7 x 1.2 x 6.2 inches (WxDxH). The GPS 72 is waterproof to IPX7 standards, meaning it can be submerged down to one meter of water for up to 30 minutes, floats, and is rugged enough to endure the most trying use. The included wrist strap, owner's manual, and quick reference guide, combined with Garmin's friendly user interface, will allow you to navigate in no time. 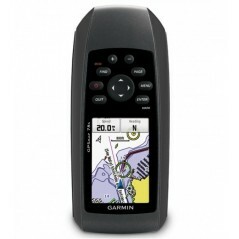 And beyond the features and functionality, the GPS 72 provides that most critical of benefits--peace of mind. With the GPS 72 you will always know where you are, where you have been, and where you are going. And since you will always know the way back home, you can concentrate on what you set out to do--explore the outdoors. The GPS 72 is a full-function GPS with a factory-loaded Marine Point Database that contains data for cities with a population of 200,000 or more worldwide, nautical navaids for North and South America, africa and tide stations for the United States. Using MapSource and the built-in 1 MB of internal memory, you can load and display a variety of points of interest. This unit features a permanent user data storage, 500 user waypoints with name and graphic symbols that allow up to 50 reversible routes, and audible alarms for anchor drag, arrival, off-course, proximity to waypoint, and clock functions. The GPS 72 also features course and speed filtering, an automatic track log with up to 10 savable tracks that let you retrace your path in both directions, and a trip computer that provides odometer, stopped time, moving and overall averages, total time, max speed, and more. And just to make sure your fishing trip is as successful as possible, the GPS 72 includes built-in celestial tables that tell you the best times for fishing in your area, as well as showing you sun and moon location calculations. The GPS 72 is a 12-channel, handheld GPS receiver with a built-in quad helix antenna. It has nine keys located on the front of the unit that allow the user to quickly access all of the unit's functions. The large 120 x 160 pixel, high-contrast FSTN, four-level gray monochrome backlit display and a large-numbers viewing option make it easy to view under variable lighting conditions. Powered by only two AA batteries, this unit will run for up to 16 hours.